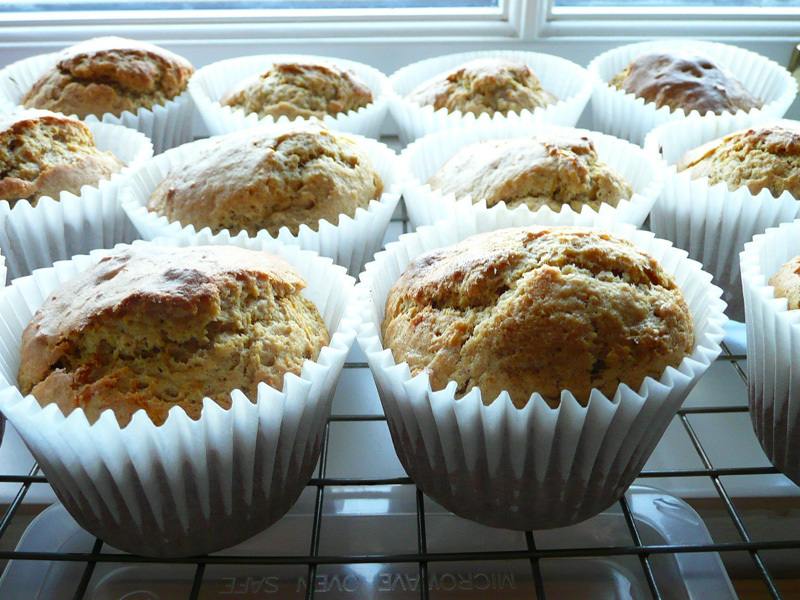 This recipe will make 12 good sized muffins (those are Lakeland muffin cases in the pic above, so probably about 2 inches deep - to give you an idea of size). Assuming you already have your carved out pumpkin flesh, allow an hour for this recipe due to cooking time. Important to know this if, like me, you are prone to whipping up a batch of cupcakes in less than half an hour for hungry mouths. 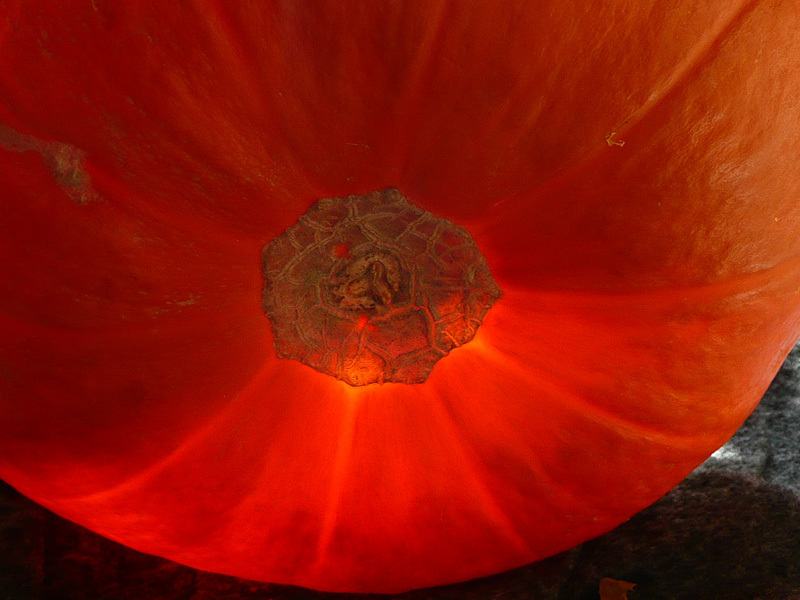 Preheat your oven to 190C /375 F/Gas 5 ready to roast your pumpkin flesh. Put in a baking dish, drizzle with oil and toss to coat. (Or put oil and pumpkin in a plastic bag and give it a shake to coat.) Roast for about 35 minutes (careful not to burn), remove, cool and mash with a fork. Then turn your oven up to 200C/400F/Gas 6. Sift your flour, baking powder and cinnamon into a large bowl. In another bowl lightly beat the egg, add the soured cream, milk, sugar, melted butter, mashed pumpkin and combine. (If adding raisins or sultanas and a half teaspoon of ground cumin, put those into this bowl with the other stuff.) Pour this in with the dry ingredients and stir until just combined. Prepare your muffin pan: either grease the wells or line with muffin cases. Spoon large dollops of the mixture into the cases or pan wells. (See below for tip.) Bake for 20 minutes until risen and golden. Leave to cool for a few minutes then transfer to a wire rack. I then carried on and iced mine as my tasters were mostly female and under 10 years old but I thought they were nice eaten plain from the oven (I don't have a sweet tooth) and of course if you've added raisins, they'll also add sweetness. 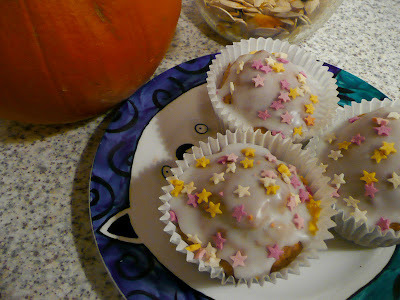 For Hallowe'en, think about icing with orange glacé icing (icing sugar and water) and chocolate stars or with white chocolate and then pipe spider webs over the top. This recipe is adapted from Susannah Blake's in the book Baking Magic - 280 pages of incredibly tempting muffins, cupcakes, biscuits - both sweet and savoury - with irresistable photos. Helpful tip - filling cake cases: When making cupcakes or muffins, I can't be bothered with the faff of spooning the mix into the cases (waaaay too messy and time consuming) - I use my ice cream scoop (like this one: Ice Cream Scoop ) i.e. a squeezy one that delivers just the right amount of mix over to the cases without mess. I didn't realise they came in different sizes, mines about 5 cm diameter. Well, we're nearly at the end of October; I had the best intentions of thrilling you all with a daily dose of cooking inspiration with pumpkin as the main ingredient which - load me up with guilt - has not happened. Those particular seeds of inspiration have fallen on stony ground thanks to a several factors: a few autumnal tummy bugs sweeping through the home, extra large doses of domesticity being required from me as I have my twent-ager niece staying with me (I begrudge housework when I could be gardening) and getting my son off to a school trip to Spain (sooo envious) … not to mention Work. The draw for my giveaway book took place (drawn by my son) and the winner is: Pandora! The book is now winging its way to Cornwall in time for some spooky and creative carving. Thank you to everyone that entered, it was such fun checking out where y'all hail from. And I found time to start my pumpkin carving experiments. Tomorrow I'm off to Fortnum's to see how the professionals do it (and will try and take loads of photos for a blog show-and-tell at the weekend). Yep - a melon baller. I spooned the orange globe into submission. My pumpkin was fairly small - about 8 inches diameter - and this really did the biz for final smoothing when getting the right thickness. You can see the array of "tools" which I worked through: Sharp knife, small sharp knife , spoon, grapefruit knife. All useful but, seriously, with the melon baller we're talking icing on cake for speed and tired hands. (Plus, I imagine that small, child-sized, hands could manage this easily.) 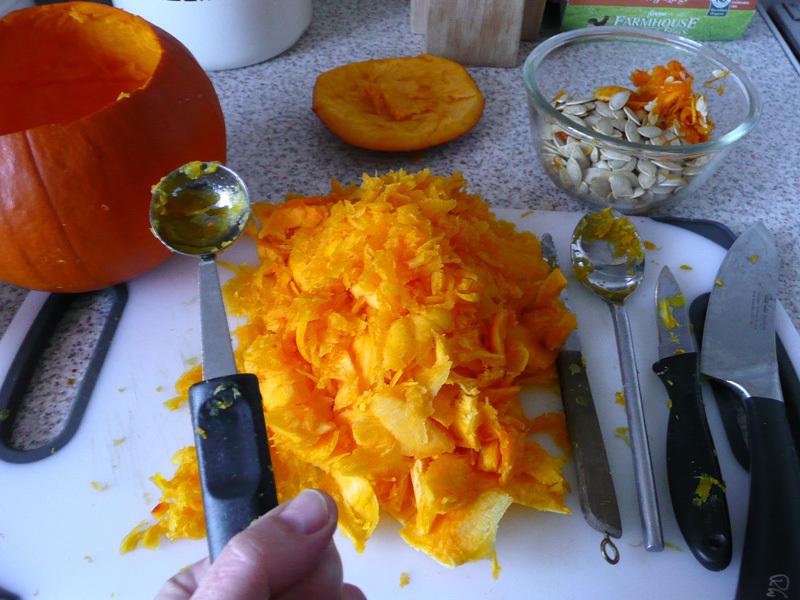 I've read elsewhere that ice-cream scoops can help; I haven't tried - yet - but I'd recommend one that has a clean edge for digging in to the pumpkin flesh. Did I mention cake? By the end, I felt that I'd earned a treat and I baked all that lovely golden flesh into Spiced Pumpkin Muffins. Yum, yum. Recipe will be posted later today - they're delicious eaten warm from the oven! There are lots of pumpkins appearing in the shops now and, (unlike me) if you were organised enough to grow some this year, I expect you've already harvested a few. Are you saving any for decorating? 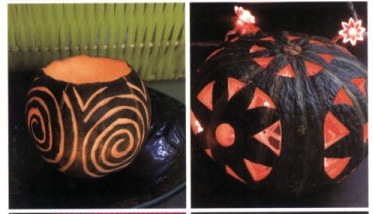 You might want to know exactly how to deal effectively with all those innards (how to get the shell really clean so your decorated pumpkin won't start to rot and stink so soon), which tools are the best to use (and where to get them from) and how to be inspired beyond the spooky Hallowe'en faces. For the more environmentally minded, there's even a project on making bird feeders from squashes - very important to keep the birds fed as the days get colder and there's less food around for them. Regardless of your carving skills, what do you do with the pumpkin flesh? I'd love to know! I've heard a lot about American Pumpkin Pie so will try and track down a recipe for that (anyone got a recommendation for me?) but check back tomorrow and I'll have a pumpkin muffin recipe for you. And don't forget to save the seeds! 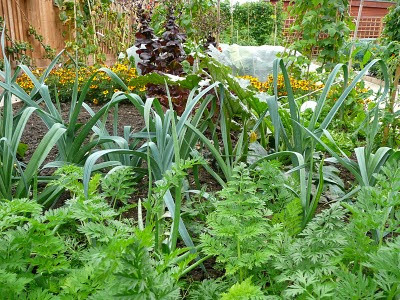 Keep a few back for re-sowing next year (wash, dry and store in dry place) and eat the rest! Try this yummy way of cooking them: Chilli Lime Roasted Pumpkin Seeds from Roamyourwayhome, one of the members on Jamie Oliver's food website. I think these would make great grown up Hallowe'en snacks! I've just popped a casserole in the oven - a piece of pork belly nestled among carrots, onion, garlic, turnip, parsnips and with sage going in later. (Trying out Heston Blumenthal's recipe of the week for Waitrose.) Bathed in home-made chicken stock (Prue Leith's recipe), it should be beautifully cooked by dinner time and all that will be needed is to mash the vegetables, fry off the meat and serve up with the crackling which is being slowly roasted in the oven alongside the casserole. It gives me huge satisfaction to know that all the vegetables and herbs in this dish (bar the turnip) have been home-grown and, for me, the wonder veg is garlic. I planted a few cloves of ordinary garlic last November along with the onion sets, partly out of curiousity and partly because I wanted to have something growing over the winter. I say "I" planted but, actually, the cloves were planted by the Veg Patch Kids, my part being to show the children how to measure the planting distance and dibble the holes (we used the handle of an old wooden spoon, marked to the correct depth) and which way up to pop the cloves in. I'm probably more amazed than they are that a single clove becomes a whole new garlic. Even more amazing, I've read that home-grown garlic cloves will adapt year on year to produce the best bulbs. So I've saved a few of my heroes to go back into the ground later this month. Will I do it again this year? Yes, absolutely. 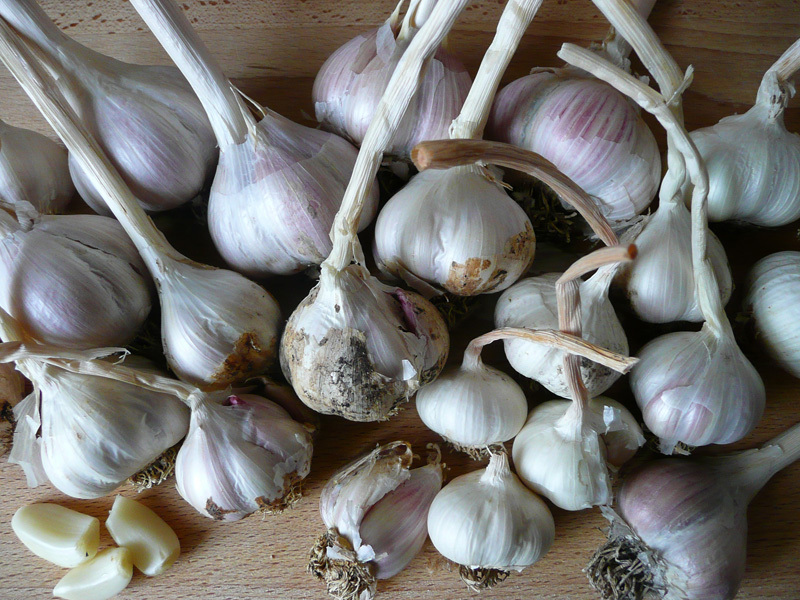 In fact, I've already selected some Porcelain Garlic which hails from the Highlands of Scotland (via Waitrose) and will plant those alongside my London/Spanish cloves - but will also be choosing some commercial bulbs to pitch against them for comparison. P.S. 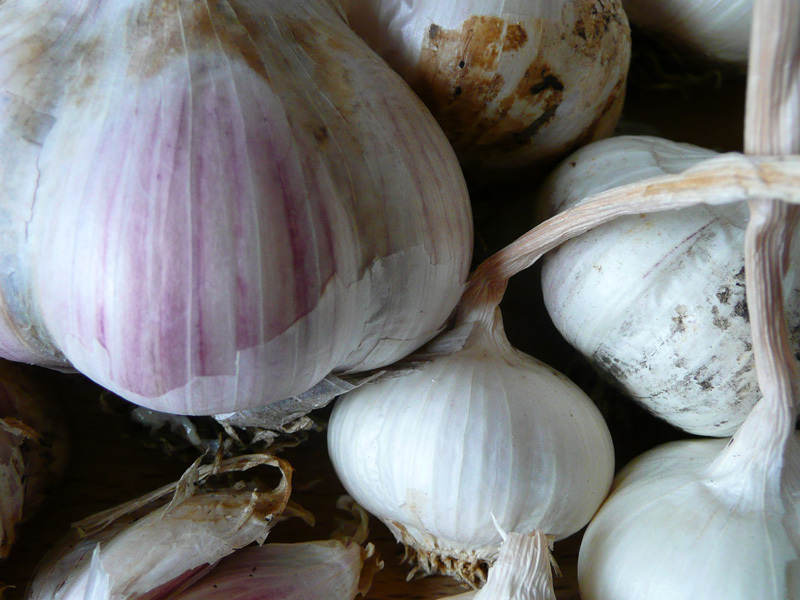 I'm sure you all know of the massively diverse health benefits of eating garlic but did you know that recent research from the University of East London reveals that garlic may be effective against the superbug MRSA? What bliss, I've actually won a giveaway! 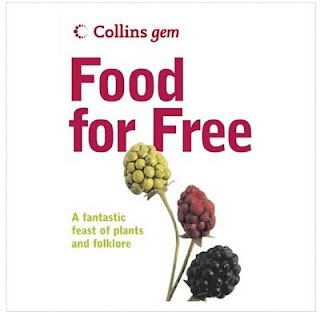 I can't begin to tell how thrilled I was yesterday morning to learn that my name was plucked from the wellie boot as the lucky recipient of this book: Collins Gem - Food For Free (The last prize I won was a Cliff Richard single from a packet of Smiths Crisps when I was 8. This one's been a long time coming.) The book was given away by Damien who writes over on Two Chances Veg Plot and is a very active member of the UK Veg Gardeners network as well as introducing his young family to the delights of foraging earlier this autumn. 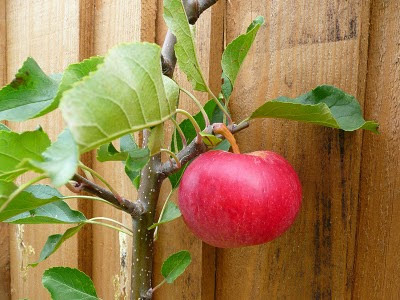 I love the idea of wild food from nature. Wonderful word, foraging. When applied to people, rather than - in its original usage - animals, what a fine concept this is for 21st century self-sufficient(ish) living and becoming reconnected to the earth around us. It's old Middle English used from the 14th century to refer to cattle wandering the land, grazing for fodder or food – forage being both (verb) the act of searching and (noun) the food itself. Obviously I've been in touch with my Inner Cow for some time as I love to munch as I walk. It would be somewhat impractical to totally embrace hedgerow eating but I feel such a townie by having no idea what I'm looking at when out on the Heath or further afield in the countryside or coast. I'm in awe of people who return from a walk with armfuls of elderberries, sloes, rose hips and wild mushrooms. This book, I'm hoping, will help me to swell their ranks. In my Cornish childhood, my father would take all four of us out walking the airfields in the early morning mists to gather large field mushrooms for breakfast - an awesome experience, akin to treasure hunting, and such fun. Expeditions like this and other nature walks full of shared knowledge were, I'm sure, partly responsible for a lifelong love of being outdoors and fostered a healthy sense of curiosity and adventure. Children on our estate go mad for the bramble berries that grow over from the railway lines and rush to pick up nuts and berries outdoors ("Can I eat this?"). Now, at last, I'll be able to say with more certainty, Ye-ess or, more probably, No! P.S. 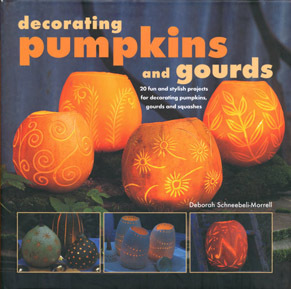 If you haven't already entered the DRAW I started in this post, to win a free copy of 'Decorating Pumpkins and Gourds', there's still time (one week to go!) - and, in case you're wondering, yes I'll post anywhere in the world! But I digress… my hopes and expectations for the day were fully met: an excellent and comprehensive training in Growing and Preserving Soft Fruits was provided by Tom from City Leaf (with handouts, which was lucky as I would never have remembered it all). In three short hours we covered the four Ps (Planting, Pruning, Propagation and Preserving) in relation to a range of soft fruits: gooseberries, red/white currants vs blackcurrants, strawberries, blackberries, blueberries and raspberries. Whew - feeling hungry yet? As if that wasn't enough, we also briefly looked at ways of training fruit, veering off into the realms of cordoned and espaliered apples. I must admit my motivation for going was to get access to an Idiot's Guide to Growing Raspberries as our canes didn't do well this year. Poor little things. I now know that this is due to a combination of not planting soon enough (nor heeling in), not preparing the site well beforehand (it was nearly Christmas and we were desperate), not giving them enough space and also the poor plants being choked by weeds from a neighbouring patch. We'd literally plonked them into the soil in a spare corner of Leigh's allotment as the Veg Patch was not ready for them. See? Loads of info. I'm going to replace the canes and, this time, lavish care and attention on them. And in anticipation of the wonderful harvest we'll all have next year, and in case any of it actually reaches our kitchens (mine will all be eaten as it ripens by the children), our group was introduced to preserving your soft fruit harvest by a local guest speaker; a wonderful woman who brought along some of her produce and made it sound so easy. She scotched several myths: no, she doesn't use special preserving sugar (juice of a lemon will serve instead, if needed), blackberries do not set well on their own (throw in a Bramley) and the original jam jar lids are just as good as the cellophane/rubber band option, if properly cleaned. Mantra: Cleanliness is all when preserving! I spotted this wonderful 1970s cookbook (Readers Digest, I think) on the table at the end. 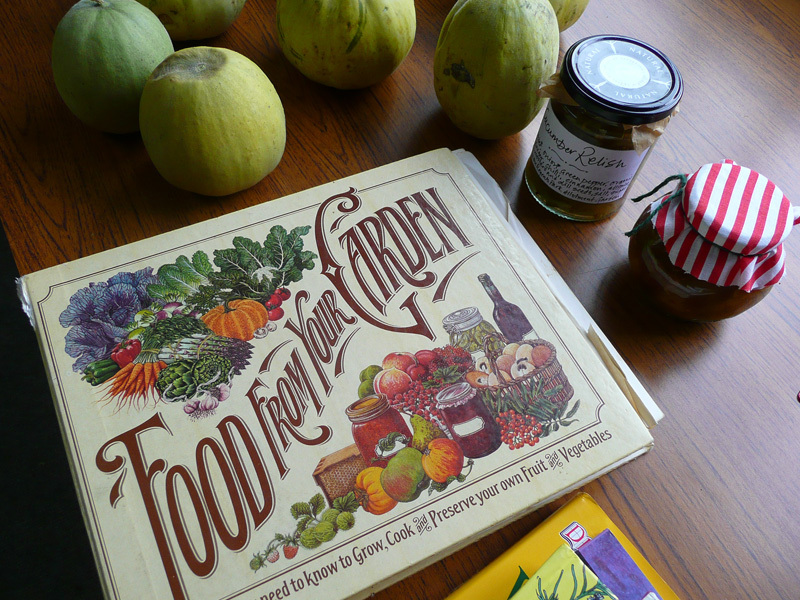 It caught my eye, set against the jars of chutney and melons grown in the allotment. Yes! Melons are possible in the UK - we had some of these fruits during the break. (Delish.) 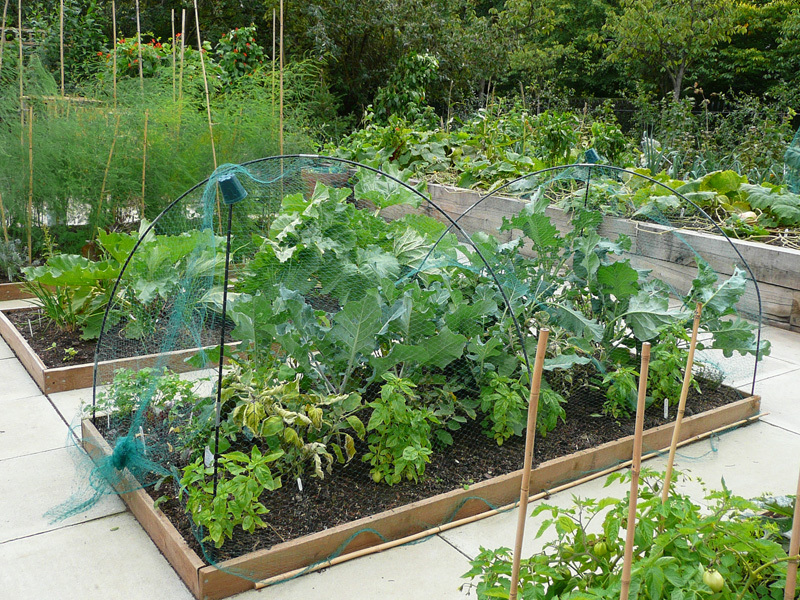 The allotment has an open aspect, sheltered by fencing on the North and East sides, with the melon vines planted at the southern end. Elsewhere, other vegetables were all still flourishing and ripening (the carrots! the rhubarb! the beans! giant tomatoes!). 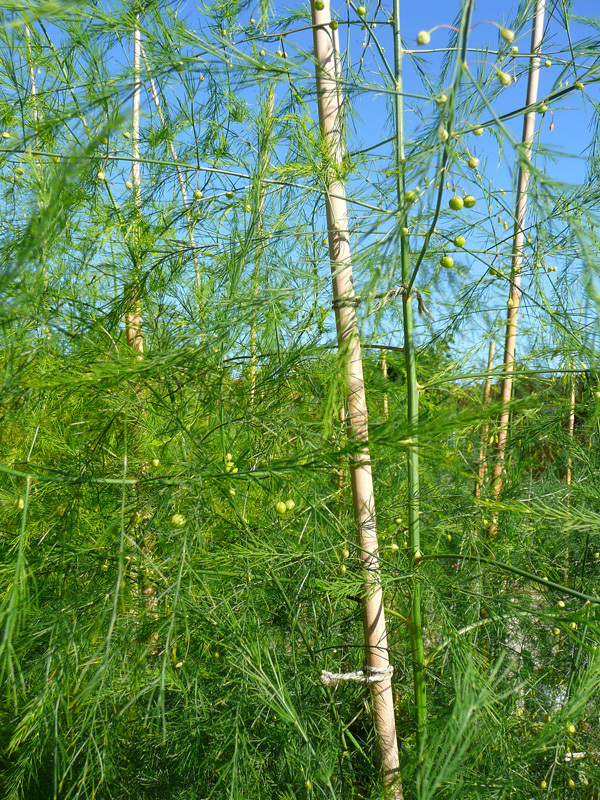 You'll recognise the asparagus in the above photo - a huge bed of it, with ripening berries. 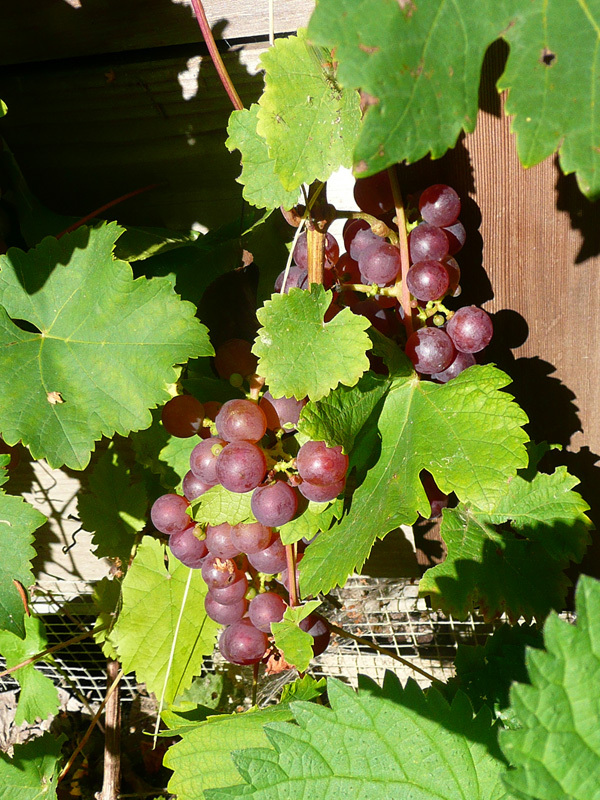 The volunteer gardeners try to nip them off when they turn red and before they burst and scatter the seeds. 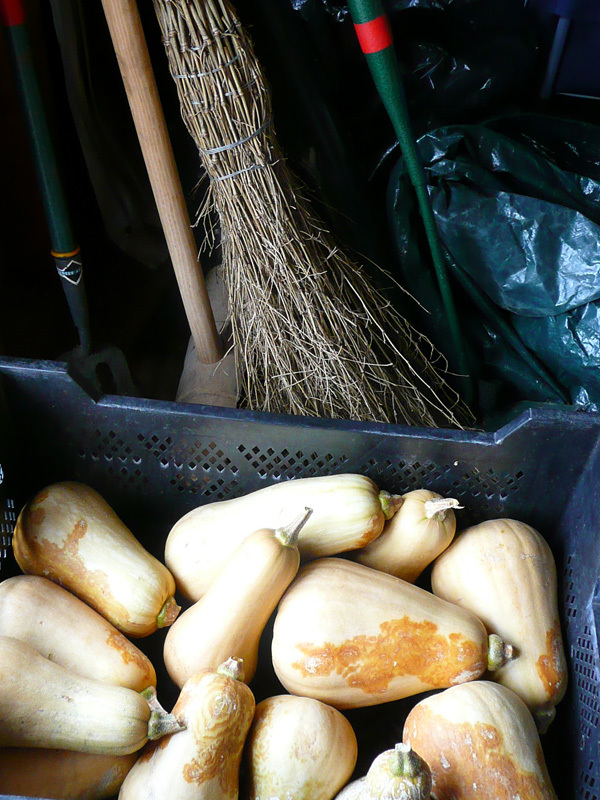 Bare patches in the beds were explained by the recent harvesting of the butternut squash which was set to one side in baskets - there was an open day 'Harvest Cook Off' the following day (at least I hope so as the weather had turned wet by then). 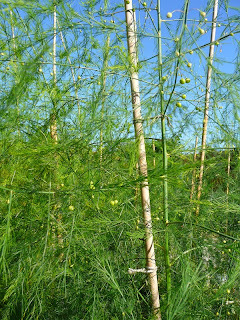 The entire allotment was full of inspiration, if excessively tidy (but then they are on permanent view to the public). 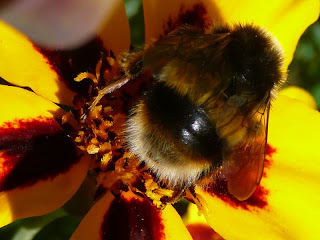 Companion planting abounded: Basil and cabbages, crimson nasturtiums under the runner beans and around the rhubarb, and bright orange tagetes were planted (and interplanted) everywhere - around tomatoes, apples, beans, herbs - and doing a fantastic job of bringing in the bees. 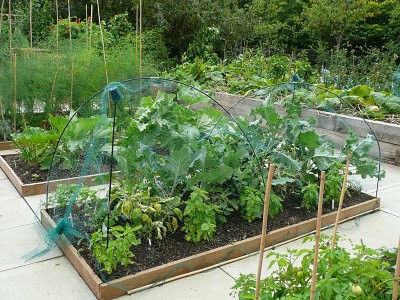 But I especially l-o-v-e-d the use of recycling: peppers, tomatoes and herbs grew in large empty white Italian tomato cans, an old Royal Parks watering can had been planted with herbs, and … the best bit for me … the fibreglass poles from a defunct tent used to hold up netting. I'm SO pinching that idea! There, I think I've rambled on long enough. It's worth a visit if you find yourself near Regents Park and also very handy the Cow and Coffee Bean Café. (Here's the Google map link). I took far too many photographs and am now making a Flickr page so, once the link is up, pop over there if you want to see more!